Making butter is remarkably easy and very satisfying. In recent years the concerns about fats, cholesterol and heart disease have made butter an almost taboo food but I believe that, like most natural foods, in moderation it will do no harm. I have even heard that the fats in low fat spreads are more harmful than the natural animal fats in butter. With all this conflicting information I think you can argue anything you eat is bad for you! OK – back to butter. The ‘ingredients’ for butter are simply cream and possibly a little salt. You can make butter from goat’s milk, but it takes a different method so I’m sticking to what I know. Making butter from cow’s milk cream. Having said that, sometimes you will find the supermarket has reduced it’s cream as it approaches the end of it’s shelf life. One Christmas Eve we found our supermarket had a load of cream reduced to 5p for a large tub. I’ve never managed to freeze cream so making butter was the ideal way to take advantage of a bargain and store it for use in the future. You need double cream or whipping cream to make butter, single cream is just too thin. You do not need much equipment to make butter at home, a bowl and large jar with a lid being the minimum. If you have a food processor or an electric whisk then the task will be much easier. Let the cream reach room temperature, around 20 C (68 F) is ideal – this is critical. Don’t heat it but leave the pots out of the fridge for a good few hours to warm up. If you have a cold kitchen, put them into the living room to warm up. Now we are ready to make butter. With a jar you need to half fill the jar, put the lid on and shake it for anything between half an hour and an hour. This is hard work, especially for any quantity and I’ve not tried it myself. 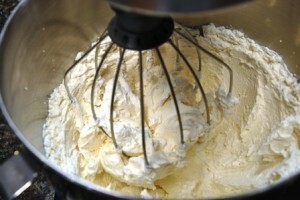 With a food processor or an electric whisk, proceed as if you are making whipped cream. In the processor, use the plastic blades if you have them. I’m told the Kenwood ‘K’ beater is the best tool if you are lucky enough to have one. It will go through the usual stage of starting to form firm peaks and then it becomes quite stiff. At this point you might like to reduce the speed of your whisk because when it goes it happens very fast. All of a sudden the cream goes a bit yellow in colour and then little bits of butter appear and a thin liquid, the buttermilk. Just seconds later, the butter seems to clump and is separated from the buttermilk. If your whisk is on high speed you are now redecorating the kitchen, hence my suggesting you reduce speed to a minimum. Drain the buttermilk off – you can use this in baking bread, scones, cooking or make your cat very happy. You need to get all the buttermilk out of the butter or the butter will quickly go rancid. Add clean cold water to the butter in the blender and operate on low speed for a minute. You need the water to be cold or you melt the butter, which will then run off with the water. Repeat the washing process until the water is really clean, this can be seven or more times but I can’t emphasise enough how you do need to make sure the water is clear. You now need to get the water out of the butter. In the old days they had special wooden paddles to press and shape the butter but you can use your hands and the back of a spoon to do this. When you have the water out you are ready for the next stage. Homemade butter can be stored for at least three months in a freezer. I do know that commercial butter stores for much longer but I think they add stabilisers or something to it, which enables longer storage. If you are going to freeze the butter, don’t salt or flavour it. The freezing process enhances the saltiness or flavour and you may well find it tasted fine on the way in but is too salty after freezing. To salt do not add more than a small half teaspoon for each half pound (250 gr) – half that amount suits me but I don’t take a lot of salt. You can also add crushed garlic or dried herbs to make flavoured butter if you wish at this stage. If you have salted or flavoured the butter, you will need to mix it thoroughly and then you can shape it. I prefer a roll of butter rather than the traditional box shape. You can then wrap the butter to keep in the fridge or to freeze if you have a lot. I find cling film ideal, but you can use greaseproof paper. For the ordinary person, making butter at home with ordinary kitchen equipment is very easy and a great way to store bargain cream. Like most things made yourself, it tastes wonderful and you control the whole process.